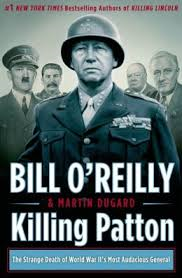 Wes Vernon offers a good review of Bill O'Reilly and Martin Dugard's Killing Patton: The Strange Death of World War II's Most Audacious General in the Washington Times. Thus, in the afterword of “Killing Patton: The Strange Death of World War II’s Most Audacious General” Mr. O'Reilly seeks to assure those who have just read this most recent volume in the co-authored (with Mr. Dugard) “killing” series that their findings are simply facts, not hype. The famous tank commander had the proverbial bull’s-eye on his back from the day it was known that he did not trust our World War II “ally,” Marshal Josef Stalin. That was at a time when official U.S. government policy was to lure Stalin’s Soviet Union to join other allies (postwar) in forming and operating what became the United Nations. Gen. Patton’s complaints included an order that American troops hold back on entering Berlin from the west until the Soviet troops could arrive in Germany from the east.